Wait, didn’t I just review this? Well, sort of. It appears that two movies were released by Georges Méliès with this title in English This “Haunted Castle” can be seen as a sort of remake of the earlier film, although they were shown with different titles in France (see below). The theme is quite similar, with a man in period costume being threatened by apparitions that appear and disappear thanks to camera trickery. It’s not clear to me whether the version we have is complete, but it’s much shorter than the earlier movie as well, and uses fewer actors, which probably meant it was cheaper to produce. What wouldn’t have been cheap is the color, which has been hand-painted frame by frame on this print, making it (arguably, as always) the “first” color horror movie. Again, it’s mostly played for laughs and whimsy, but there’s a skeleton and a Devil, so it can be seen as a Halloween-themed movie. Alternate Titles: Le château hanté. The sets, costumes, and props are all the same! This is not Smith’s film. He couldn’t have copied it so accurately in visual design. I think you have missed the point. The other commenter was saying that the Melies film is lost, so all we have is the remake. There would be no way to compare props, sets, etc. to a film that doesn’t exist. However, the actor in this film is pretty definitely Melies, so I think it’s a moot point. Smith’s is lost, Melies is here. If somebody has some documentation that Melies “Le Chateau hante” (1897) is lost please share; and Wikipedia could use the information. I have read, in a few places, that this is Smith’s version. I thought that I had read it in a book too – more reliable – but I can’t find it now. I have also read on one site that Smith’s version is the lost one. Same title, same year, conflicting info on the internet, AND the same film is credited as both versions, to both men just depending on the website; it’s quite confusing. Just trying to help the truth surface. 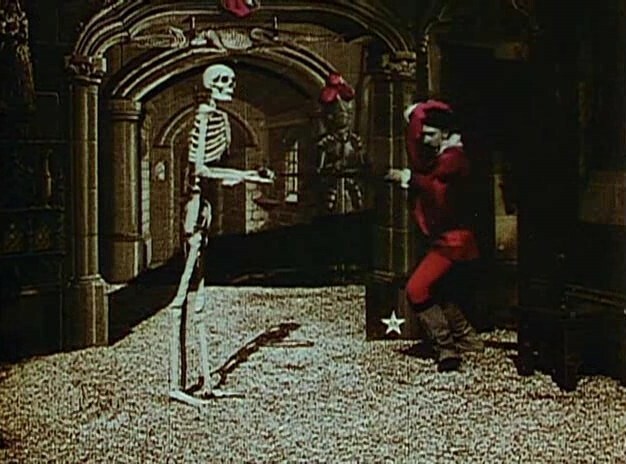 and The Haunted Castle (1897) by George Albert Smith return the same film. I have not found that Smith’s was lost, so thanks. Happy to be of service! Sorry for the bad news.